Over the years, World War II has proven to be fertile territory for the motion picture industry – so much so that nearly every conceivable tale, event, and “angle” has been covered. However, although the “nothing new under the sun” phrase applies to Lone Sherfig’s Their Finest, this story can claim the virtue of not having become worn out through repetition. The historically-based movie focuses on how the British film industry infused its productions with none-too-subtle propaganda to bolster the patriotism of those within the U.K. and influence the international narrative (in particular, trying to draw the then-“neutral” United States into the conflict). Although the film-within-a-film isn’t especially good (and we see quite a bit of it), it provides a glimpse behind the curtain of wartime life and movie-making during the Blitz. Their Finest takes place during the early years of the war (before Pearl Harbor). Injured artist Ellis Cole (Jack Huston) has returned to London from Wales with a new wife, Catrin (Gemma Arterton), and a determination to sell his art. To provide financial support as Ellis seeks an audience for his work, Catrin seeks employment as a secretary but ends up working for an arm of the government’s propaganda department writing pro-war shorts that will be shown prior to theatrical features. Eventually, she is drafted to help head screenwriter Tom Buckley (Sam Claflin) pen the script for a Dunkirk-inspired melodrama. As Catrin settles into her role and spends an increasing amount of time away from home, Ellis begins to feel neglected. Meanwhile, Catrin becomes increasingly respected by her co-workers, including haughty actor Ambrose Hilliard (Bill Nighy), who is having trouble adjusting to the fact that his leading man days are behind him. Although the narrative for Their Finest occasionally rambles (too much time is spent buffing Ambrose’s backstory, which is only tangentially germane to the main tale), it is by-and-large a stirring drama that incorporates lighter moments with scenes of deeply felt tragedy. The film is able to provide a catharsis in its closing scenes but there’s an element of the bittersweet in the way things are resolved. Although Their Finest isn’t based on a true story per-se, many events mirror those that took place in real life. Although the characters and events are fictional, the depiction of the political climate and the pro-war advocacy of the British film industry is accurate. (Hitchcock is the most famous example of a director who participated in this effort.) By incorporating a romantic element into the narrative and adding some snappy dialogue, the production adds mainstream appeal (rather than being targeted solely for WW2 buffs). The Dunkirk movie (about how two sisters and their drunken uncle save fleeing soldiers) offers a window into the give-and-take necessary to make these sorts of films. By modern standards, this is a campy endeavor but it’s viewed by audiences of the day as a triumph. That says something about how expectations have changed. Although a handful of classics from the 1940s are still watched, the vast majority of movies from that era are (justifiably) ignored or forgotten except as time capsules. Gemma Arterton evinces a strong screen presence. Her Catrin is an independent, fully realized character who struggles against feelings she might be developing for Tom out of deference to Ellis. Sam Claflin, the hunky Finnick from The Hunger Games series, shows a more buttoned-down, serious side here (he’s hardly recognizable in spectacles and a suit). Bill Nighy, as is often the case, commands the viewer’s attention every moment he’s in front of the camera (which is probably a reason why unnecessary scenes have been added featuring Ambrose). Richard E. Grant and Jeremy Irons have small parts. Although Their Finest would be solidly entertaining at any time, its U.S. release fortuitously coincides with the advent of Christopher Nolan’s high-profile adventure film about Dunkirk. 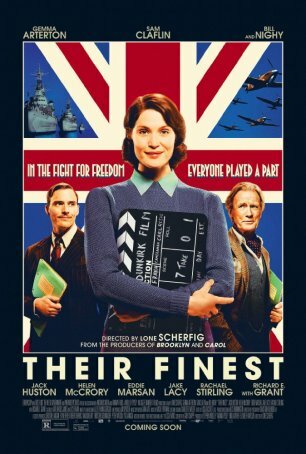 Their Finest makes a good companion piece and provides a different perspective about how this critical early war event firmed up the British resolve to resist Germany.